(Central Islip, N.Y., Feb. 24, 2014) – Former Major League veteran Lew Ford has signed on to become a player/hitting coach for the 2014 season with the Long Island Ducks, the team announced today. “Lew has experienced so much from a player’s perspective,” said Ducks president and general manager Michael Pfaff. “He has played at the game’s highest level, competed in the Atlantic League and been part of two championship teams, and has returned to the Majors from the ALPB. He has a lot to offer as both a player and a coach, and we’re excited to welcome him back." Ford has played for the Ducks in each of the past three seasons. In 2013, he joined the Flock in August and picked up hits in 16 of 17 regular season games, compiling a .377 batting average, seven RBI and 11 runs. 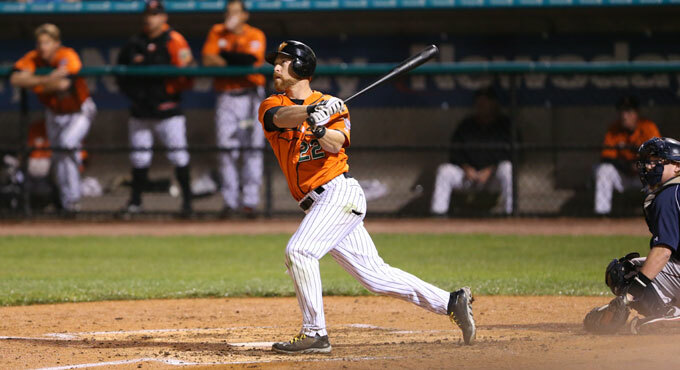 He then earned at least one hit in all seven postseason games he played, batting .412, and launching a game-tying two-run homer in Game Two of the Atlantic League Championship Series. In four seasons with the Ducks (2009, 2011-13), the Texas native has a .330 batting average (club record), 24 home runs, 121 RBI and 55 doubles over 201 games. The 37-year-old has spent parts of six years at the Major League level, including five years with the Minnesota Twins (2003-07) where he earned three postseason berths. His best year came in 2004 when he batted .299 with 15 home runs, 72 RBI, 31 doubles, four triples and 20 stolen bases. After starting 2012 with the Ducks and earning a contract with the Baltimore Orioles organization, the Islip Terrace resident returned to “The Show” in July of that year, becoming the 13th player in franchise history to reach the Majors after playing on Long Island. He would pick up three homers and four RBI in 25 games, helping the Orioles to the American League Division Series against the New York Yankees. Ford was originally drafted by the Boston Red Sox in the 12th round of the 1999 amateur draft.